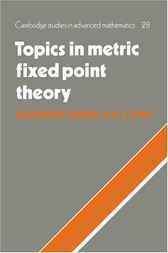 Metric Fixed Point Theory has proved a flourishing area of research for many mathematicians. This book aims to offer the mathematical community an accessible, self-contained account which can be used as an introduction to the subject and its development. It will be understandable to a wide audience, including non-specialists, and provide a source of examples, references and new approaches for those currently working in the subject.